In just the past year and a half, pioneers in the field of trauma therapy have once again discovered more effective methods for working with trauma patients. These are techniques I couldn’t have dreamed of when I began clinical practice, and for the most part, they weren’t prevalent five years or even two years ago. I’d like to share with you some of the leading edge research and treatment options that this third wave has introduced – for more information, just click here. What changes have you seen in your work with the treatment of trauma? Please leave a comment below. The next wave will come when people working in the field realise that all of the neuroscience of mental health is a distraction. All of that esoteric ‘knowledge’ makes us sound intelligent and expert but it adds nothing of practical therapeutic value. Everything we need to know is visible in mind, which remains largely ignored by the devotees of science because the mind is not measurable and verifiable using scientific methods. This is why the field of mental health has been stuck in the same place for over a century. This is why mental health problems continue to proliferate and the professions have no answers. It is the belief that trauma is overwhelmingly complex (because of its complex presentation) that precludes us from observing the obvious. The mechanisms of trauma are in fact ridiculously simple. Trauma is emotionally painful experience that the brain has been unable to process, meaning that the emotion and ideas associated with the experience were not discharged. The brain processes experience in mind, where the experience becomes visible to it. If the experience is excluded from mind, due to pain avoidance, it cannot be processed. You want to predict who gets PTSD and who doesn’t? Those who get PTSD are successful at keeping the experience (the intrusions) from mind where it cannot be processed. Those who don’t get PTSD were unable to prevent the intrusions. The intrusions represent the brain’s imperative to place to experience in mind to process it. We don’t need to predict who will get PTSD. We just need to heal them. Trying to understand how the brain processes experience is a waste of time. We don’t need to know, much in the way we don’t need to know about mother boards and CPUs to send an email. In my experience it is rare to come across a trauma that cannot be fully discharged in a single two hour session. This essay is missing a very important development that has been growing since the end of World War II, music and arts therapies. Unlike so many of the other potential therapies mentioned here, the potential for harm from the various arts therapies is almost non-existent, where all the other therapies listed do have the potential for harm as well as good. A good systems approach to treatment would include these as well. Perhaps the clinical psychology field needs to take the Hippocratic oath seriously. Working in the field of out of home care, (foster care and residential care)I have studied through the Australian Childhood Foundation, they have great resources on their website. I have working in the field of social care for over thirty years both with adults and children. What strikes me is some of the early learning links into the recent research, we did not always know back then why working within Rogerian principles worked but now we know about the importance of relationships and establishing safety upon the brain. Also, Intendive Interaction (Dave Hewitt) had some amazing results working with people with learning disabilities and autism. My training and subsequent study on neurobiology explains why this was so successful. More research should be done in this area, we need not to work in silo’s but incorporate this knowledge about the brain across other fields. Not receiving the confirmation email. Your series are of such high value, I don’t want to miss. Please resend. I haven’t worked specifically with trauma…at least with adults. I worked as a child therapist in the 70’s and 80’s. I did work with children who had experienced trauma. I used play therapy and worked with the parents helping them to re-bond with their child. I was in London and was aware of the work John Bowlby was doing. I was working blind. In fact one 3 and a half year old had been kidnapped and wasn’t found and rescued for over a year. I did see the little girl in play therapy, but mostly I worked with the parents. The father was actually blind and I used his blindness as a metaphor the work we were doing. I knew that we had to try to re-build attachment. Well, the story goes on, of course. I just wanted to share a little. Love your synthesis of third wave approaches. I predict a fourth wave. In my forth coming book i argue against the model of trauma/no trauma. (Based on my forty five years of personal healing–near death at birth, extreme abuse, violence, serious beatings, constant verbal assaults, etc throughout childhood; and upon my professional experience as a psychotherapist, movement teacher and structural integrator). I argue for a model and ideal of coherence–based on the biochemistry/quantum physics of Dr Mae-Wan Ho, I believe we all have a great deal of room to grow in the direction of coherence. Simply defined, coherence is a state in which both individual autonomy and global cohesion are maximized. I argue this applies to the body-its tissues, structure and movement. It applies to our psyche, identities, beliefs and emotions. And it applies to our relationships. Hurray for the right brain, body oriented treatments coming in; but let’s go further. We’re all on the same bus. Thank you for commenting. Millions of snbilig abuse survivors never speak about what happened. They do this because they are loyal to their family bonds. I would suggest that you might try a therapy called EMDR. The trauma related to a snbilig is very scarring. Talk therapy does not help with a violation done by a snbilig.In my life, I am able to speak out because I have lost my entire family (inclusive of over 45 relatives) and my only son. It is time to speak out about this type of abuse and I will do so in my book. It will come out through HCI, April 2013. My first PTSD case was in the mid-70s. I used talk therapy, visualization, the two chair technique, and some body work to treat her. Since she did not have clear memories of some of her experiences but was having nightmares giving information, I helped her to reframe the nightmares to her mind’s attempt to give her information and help her understand what happened to her. I definitely was flying by the seat of my pants on this one, believe me. Back then, I don’t think anyone in my sphere of practice had ever heard of working the way I was working, even my supervisor. My work was more intuitive than learned skills but she and I learned together and she improved significantly during her treatment. A few years ago I became certified in Trauma-Focused Cognitive Behavior Therapy, and have used it with traumatized children, and adapted it for adults to some extent, but I find a combination of treatment approaches to be most helpful when working with people who have developed PTSD subsequent to trauma. What exciting time it is for working with trauma. It has changed my appoach to working with trauma to a more body centered approach. Truly with all due respect, you are not the pioneers. The sages who first taught Yoga understood all this. That is why Dr. Bessel van der Kolk repeatedly cites Yoga as the prime tool for trauma recovery. With respect and gratitude. I agree with Laura Plumb. I am being treated by Dr. Punjab Naram, who treats the Dali Lama, and who treated Mother Teresa. Dr. Naram does not use the word “trauma” very much, but he describes many cases of traumatized people healed by marmas (pressure points) and by mantras and natural remedies. The marma is a form of body work developed over the past 5,000-6,000 years. In a sense, the repetition of a mantra is also a form of body work. The methodology has been passed down in secret to Ayurvedic practitioners, and only recently has information about them been revealed to the public. A fruitful field for study, I’d say. It doesn’t require the radiation of a brain scan, and can supplement what we’re learning through modern science. I have great respect for Bessel Van der Kolk and the people who contribute to the healing of the damages of trauma. I am an advocate for EMDR,(Eye Movement Desensitization and Reprocessing) having been trained in 1991 by Francine Shapiro, research scientist who discovered the process. Integrating it with all my knowledge since being in the field since 1982, I find it transformative and goes beyond talk therapy. I also teach EFT (Emotional Freedom Technique) as a take home skill, so that people can take charge of themselves in the moment of distress. Mindfulness, Yoga, body work, can all help. It is wonderful to be working in such a field these days. We have so much to offer in healing the pain people suffer long past their trauma. Many persons observed that now a lot of their colleges and people they know have this traumas but a lot of them can forget about the traumas. The answer how, it is to have a good education, without lies and also be connected to a spiritual, religious side. Yoga, Reiki and natural medicines are also a very good side for them and in case some of such trauma persons can collaborate between them is a more happier possibility. Most of all to concentrate on their mind and stay equilibrated. An answer from an expert! Thanks for cottgibuninr. In the post below our group has predicted more workplace violence on the horizon. If you can acknowledge what we are saying we would love to hear from you. please post a comment or call me at 25 three, 32 six, 4 four 85. The main changes we see in Stop The Bullies is that workplace bullies are getting sicker, sneakier, and more malicious. It is a sport to these people, and the Targets are getting more injured. Most have to stay in the abusive environment to survive. We are also seeing more and more people who have been bullied out of their jobs and have NO financial resources whatsoever. Most find themselves with a diagnosis of PTSD, whether or not there was some physical abuse by their bully. This group of people is SINGULARLY unable to pay for treatment. Mostly, bullying happens not to the inept (who simply get fired) but to the conscientious employee who has years and years of civil service with excellent performance record. Please note: It is not the fired employee who is in this position – it is the employee who is tortured then fired some years later. These are the kinds of situations where people return to the workplace with a gun or knife. We predict more work violence as long as America does not care about these victims. This is not to condone the violence, but when someone’s ENTIRE LIFE is masticated (i e they lose their job, career, health, health insurance, retirement, home and family) that person is left bewildered and unable to pay for even the simplest mental health care. While I applaud Ruth and her colleagues for disseminating this information, I hope they spare a thought for our folks – people who were maliciously bullied out of their jobs – They need mental health care as much as the combat vet. Our group members who have been in hand to hand combat and have also experienced one of these bullies tell us that the constant and merciless abuse for 8 hrs a day at the hands of a malicious bully and over a number of months or years – they tell us the workplace bullying is worse – WORSE. WORSE than for 9-11 rescuers – WORSE than being a train driver and have someone throw themselves in front of your train . Who should pay for their mental health care? If employers had to pay, then they would rehabilitate their bullies or fire them. We have one bully who was not removed until she bullied 24 people out of their jobs. This woman grabbed her subordinates IN BETWEEN THE BREASTS !! Please could someone respond to this post? Thanks. You can also call me at 2 five 3, 32 six, four 485. Thanks. I appreciate your series a lot as you keep refining your “up-dates” of our field and I try to stay connected to your work. I have worked with the freeze response with clients for many years using MBAT, mindfulness based art therapy approach, with specific techniques for generating new resources, and releasing old patterns of response to trauma. I notice that you do not include art therapy in your series. Is there reason why? Mindfulness plus meditation have been very helpful. I am not a therapist. I am someone who tries to understand PTSD from the inside out as well as from the outside in. I sincerely hope that this third wave moves us closer towards realizing that as long as a division exists between the analyzer and the analyzed … it will be business as usual. The Mindfulness Movement comes closest to understanding that a psychological dualist approach between client and therapist only perpetuates the past and therefore inhibits moment to moment awareness and insight. I am adding this because it is important part of the healing modalities to know. Healing can be very complicated… For me, EMDR brought emotions I had never before experienced and realizations that brought me to my knees. With this came a long process of acceptance, forgiveness and then grieving the loss of what I once believed was my truth. It has been a lonely process, for what is discussed in the privacy of the counseling hour has not been something I could ever share with anyone, including the wonderful friends and family members of my life. My goal, from the moment I first met my therapist was to leave counseling whole, grateful and without a feeling of dependency on him. As I heal, I now start the process of leaving the only person who knows everything I wish had never happened. The dependency I tried to avoid has been un-avoidable, the gratefulness that I feel is profound for this man, who with integrity and professionalism, provided a safe haven for this ‘journey out’. After 6 years of intentionally entering (and sometimes forcing myself to enter) that room, I am finally at peace. I am slowly telling close friends (who do not pry) some of my journey, but only if it also helps them or someone else. Details are never important, but how one faces adversity in a proactive way is important to all of us. I have never seen a book that provides a roadmap out of counseling. Maybe one of you can write one? My goal is to leave counseling permanently, without this being another loss and with the knowledge that I am indeed capable of living the rest of my life finding my own answers and knowing that I am finally ‘done’. As a teacher and as a Vietnam PTSD client, I have seen them all. I have not found EMDR or talking helpful. My experience was so constant and consistent and over a very long time that it is different than a particular event. I was also as a medic in a field hospital that I was faced with constant traumatic injuries, day and night. Relationships and feeling understood and recognizing what I was experiencing made sense given my experiences was very helpful initially. Also, the neuroscience has opened me up to mindfulness work. I still rely heavily on Medication. Things can get very strange and come at moments you are not expecting them. Thank you for this concise depiction of the evolution of PTSD. The biggest change for me has been in recognizing how the body can identify what the true issue is for each event and each individual. Understanding the Polyvagal theory has certainly helped clarify some thoughts but for my practice more refined muscle testing (using indicators from the mind-body to identify specific focus areas and determine most appropriate modality or process) has made all the difference. I work in a setting where unfortunately, the clinician in charge, is not keeping up to date on newer research. This is frustrating. It is limiting. I want to stay on top of new approaches, I appreciate your efforts. I am so happy you listed Rubenfeld, when relating to some “exceptions,” in your article above, using genle hands on and verbal exchange, it has been helpful for over 30 some years. I have been a Rubenfeld Practitioner for many years, and it is so true that how the body contracted or compressed has stories to tell and when investigated reveals a reflection of a life lived, trauma included. I am also an Alexander Technique Teacher which has for over one hundred years focused on the juncture of head, neck and spine and how habitual compression along with stress and trauma relates to “flight, fight or freeze.” It seems it is all coming together now with new research and I am excited to participate in your series. make this possible. EMDR, yoga, meditation, and one or another of the somatic experiencing therapies, in concert with psychodynamic therapy, offer many persons the healing they need. . The role of psychodynamic therapy has been extensively documented in the psychoanalytic literature by such authors as Mardi Horowitz, Krystal, Judith Herman, D. Laub, Nanette Auerhahn, and many others. Thank you for this series Ruth. I am getting so much out of this and it is a wonderful tool for trauma therapy. Over the years I have watched “alternative” practices, like EFT and TFT, become accepted in the mainstream and substantiated by science. I remember the days when I was frowned upon for using Heartmath and EFT in schools with disruptive and learning disabled students. We have come a long way. The future of psychology looks brighter to me now than it did 20 years ago. Yes, trauma treatment has changed, and continues to change. It breaks my heart to see survivors of trauma still re-traumatized over and over again through insurance assessments that force them to re-tell their stories in words. If only the rest of the world would keep pace with these advances, our approach to education, to social justice and even to how we approach collectively dealing with endemic stress would change. From a sensorimotor psychotherapy viewpoint, we make a clear and profound distinction between freeze (tonic immobility with high sympathetic outflow) and feigned death (collapse and loss of sympathetic outflow) – there are many different reasons why this distinction is important and it will make a good question for Pat Ogden during your interview with her. Twenty-five years ago I wouldn’t have understood what I wrote just now! But we were using it nonetheless — just less consciously and less effectively. Thank you for putting together these ‘Trauma Series’. As a RN in a major Medical ICU, I witnessed very traumatic happenings for our patients and their families. I was able to draw on what I have learned through these webinars to be a more affective caregiver. I became very good at coping. I learned how to turn off fear in seconds until the next nightmare or unexpected “trigger”. At times, life inside of me was like living in a nightmare, as the people around me witnessed instead my smile or my children joined me as I attempted to make wonderful childhood memories for them… We camped, hiked through woods and our home was a gathering place for their friends. I ‘went through the motions’ and dreaded alone time because I didn’t have these distractions. Six years ago, I found a therapist who has patiently helped me learn how to tolerate the fear I would experience “out of the blue” or in the middle of the night. I have been able to take partial memories and make peace with them. Forgiveness has been a huge piece of my healing. He and much of the material on your Webinar, along with the books that many of your speakers have written, are the reason that I am starting to feel like I once felt many years ago. The most important factor has been belief and validation of what ‘I EXPERIENCED’ and a focus on ‘leaning into’ rather than ‘running from’ the strongly negative feelings or fear. but hushing the response of fear. Awesome. Great description. Thank you. I am working according the EMDR method and used EFT as well very affectively. This method helps people in a very quick way to process the trauma. 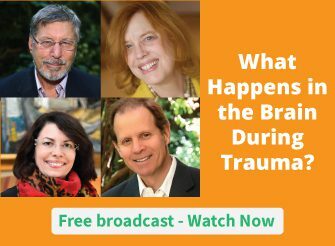 It is exciting to experience understanding the way of trauma and the brain. I appreciate your sharing of information on the latest developments arising from the understanding offered by neuropsychology. In reference to PTSD one change being discussed locally to me is intervention time after trauma event. There has been historical criticism of intervening too soon with talking therapies after trauma, and of course diagnostic criteria asks us to identify trauma symptoms still present three months following. So interventions generally recommended to support ‘stabilising’ only. The Berkshire Trauma Service advised on a more idiosyncratic approach, if treatment appears indicated sooner, perhaps following assessment of resilience and psychological mindedness (for CBT interventions) then to go ahead and treat. Thanks and all the best Chris. I am still finding EMDR and TFT very effective, and am excited about Dr. Allan Botkin’s discovery of IADC and am taking his training in Illinois later this month. He developed it while doing EMDR at a veteran’s hospital in the Chicago area. It completely clears long-standing grief from loss through death, in one or two sessions. I highly recommend his book, Induced After Death Communication: A Miraculous Therapy for Grief and Loss, by Allan L. Botkin, PsyD and Craig Hogan. I’m a Somatic Experiencing practitioner, Feldenkrais Practitioner and assistant at the master level is Peter Levine. This is SO refreshing to see and read. For those interested, I did an interview with one of my colleagues, also a high level assistant within the SE world, on the topic of Neuroception, would LOVE to share. I live in a Canadian city of over one million people, Calgary AB. In my opinion we are in the dark ages here. The go to therapy is still CBT. DBT is staring to make an appearance but the wait lists are very long. I have been constantly traumatized physically and mentally by the psychiatric system here in Calagry and had given up on my healing journey. A friend in the U.S sent me information on current treatments and I finally feel some hope that I can be healed. Many of my questions regarding ineffective treatment have been answered. Thank you for all the information you send it has helped me immensely. Huge! difference, from lost to could be found, from hopeless to you ca do it, from bear it to heal it. I am wondering if in the series anyone is talking about working with the limbic system; and talking about the freeze specifically. What exactly is best used with freeze? How do you determine witch part of the brain is triggered or in unbalance in the client? what works best treating each part of the brain? My practice is totally integrative, with components of the myriad masters with whom I have studied. (I’ve taken some of your webinars.) The process that impresses me the most, is the direct root to deep healing, using EMDR. I facilitated transformation in a man who had repeatedly raped his wife for twenty years. The rage and self-loathing in him from his past fueled his evil. I’ve facilitated people’s healing of seizures (some of them from anxiety), resentments in marital relationships, the shame that is often under layers of justification with affairs, the impact on affairs and the ruminating that often occurs with the wounded partner. Acknowledging my “addiction” to learning, I have created some of my own “processes” including aspects of neurolinguistics, journalling, cognitive/behavioral, attachment theory, Imago and the list will never end when I experience something that could enrich my help for people who are suffering – with trauma, with self-esteem issues, with anger, depression…. Our responsibility, our privilege, our love for our clients can change their brains in ways that open their lives and their ability to love themselves and others. What we do will radiate out into families, workplaces, the world. I am awed by my choice of career. Thirty-two years and still learning. Thanks to people like you who have much to offer. However, whomever we can thank for neuroplasticity and our ability with our own limbic system to engage others and lead them into a whole, healthy way of being! It’s awesome! Nice overview. And there was also an ancestor of the first stage espoused by misguided followers of Skinner, who thought that mere survival and will power would do the trick. I remember a professor, who proudly described his cure of a shocked and traumatized dog by repeatedly returning the animal to the site of trauma without repeating the shock. While the “cure” was eventually somewhat effective for the dog, presumably because of what we now know to be processes of memory, it was also traumatizing for psych students to hear. Applying this flooding method to humans, especially those with what we would now call dis-regulated attachment, was actually cruel as well as misguided and authoritarian. Survivors of battle shock in WW2 and Vietnam had to endure this “pull up your socks and get on with it” treatment. It is a remarkably visible shift in consciousness in our field that we have sought for more effective and empathically related methods and even found the rationale in neuroscience to support them. Please do not discount that the internal injuries can cause seemingly mental health issues (due to the clinicians perspective), when in reality it is the injury, the damaged tissue itself that is causing the bodily responses. Vagus nerve can be affected by intestinal blockage pressing on the nerve. Clearly here we would remove the blockage and free the vagus nerve (which by the time the blockage is removed the nerve may be damaged), and NOT treat as so called PTSD or mental illness. CORRECT DIAGNOSIS is imperative, as there are many negligent MD’s all too willing to hand over a mental illness dx when in reality they have missed the correct physical disability, while they pass on from doctor to doctor the mis-Dx and while patient gets “sicker and sicker”. There may be a degree of ptsd at work, yet if the patient is denied the means to heal or attend to the physical body, the “mind” stuff becomes mute. As stated above the intestinal blockages need detoxing, proper amounts of stretching and exercise as well as stress management. Too many times, also brain injury and brain/vessel abnormalities are overlooked and poo pooed. This is not only detrimental to client but may be deadly when mishandled. For if you call a patient severley depressed due to lethargy and lack of motivation when in fact they have a brain injury with blockage and vessel malformations and slow blood flow through vital conscious areas, ((slowing breathing capacity))of the brain, to treat this as mental illness is wrong, IT IS A PHYSICAL injury needing medical NOT psychological intervention. Once the patient is properly breathing, getting sufficient oxygen to body organs, the brain can “think ” again, and they are oheir way to wellness. JUST A NOTE: Bloodwork may look good, chest x-rays ok…..but when arterial blood gas is done the overwhelming lack of oxygen is startling….BE SURE there is a FULL medical evaluation before DX any mental illness, so many are dx with mental illness when there is an organic physical cause easily remedied. This is how (we) you may be putting trauma upon trauma. There is much progress in the healing of trauma, and I am grateful for the flow. I have also followed the changes and I am amazed at what we knoe at the moment. I am especially interested in brainentrainment and how to combine it with other brain and bodyoriented approaches.